The Rental Rate shown is for a 24-hour period during the week or Friday to Monday. Black or White seat cushions available in stock. If you require a different color cushion please contact an Encore Sales Representative for a quote. Made of highest form of resin available, K-Resin. Measurements: 15.75''W x 36.5''H x 18.5''D. 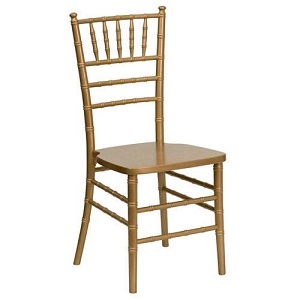 * Please call us for any questions on our chiavari chair gold rentals in Shreveport and Bossier City, Louisiana.